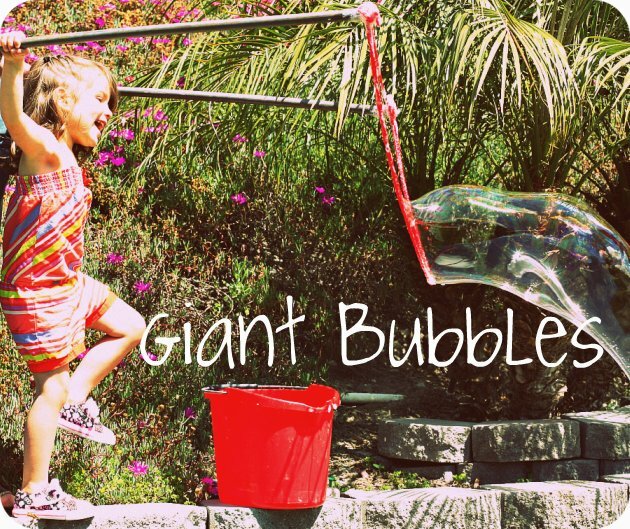 This giant bubble make is one of my favorite DIY projects! It’s so easy to make and is great fun for the kid’s. 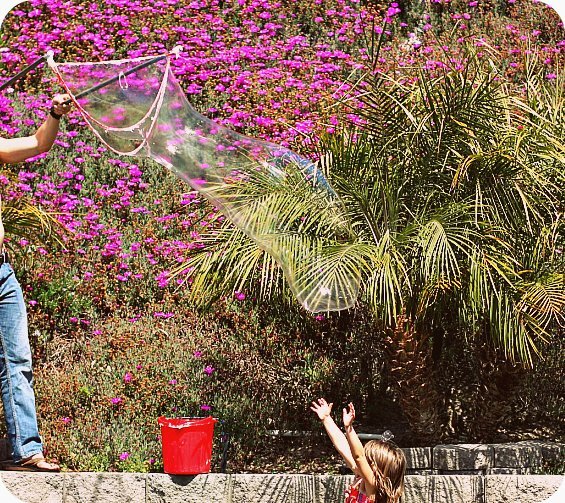 Here’s everything you need to make these fun bubbles. 1: (1) 6 foot long piece of 3/4″ round wooden dowel (available at any hardware store for about 3$). The wooden dowel will be cut into two 3′ long pieces. 2: (2) simple metal mug hooks. (I used 1″ brass hooks, but any metal hooks will do). 4: A bucket for your bubble mix. Tools: A saw to cut the dowel (many hardware stores will do it for you if you ask), a pair of pliers and scissors to cut the yarn. Screw a hook into one end of each of the dowels. (The dowel should be soft enough to screw the hooks into without drilling, hold the hooks with pliers if it is tough to do). Cut the yarn into the three pieces as stated above and tie loops at the end of each piece. Loop one end of each piece of yarn onto the hook on each dowel. When all the yarn is on the hooks, take the pliers and squeeze the hook closed. You should now have two wands that you can hold at one end with the other end connected by 3 pieces of yarn (short, medium and long). Dip the yarn end into the bucket with the bubble mix and spread out the ends of the yarn and hold into the wind and watch the kids go crazy! I saw this on Pinterest a few summers ago and tried it .Meghan loved it! 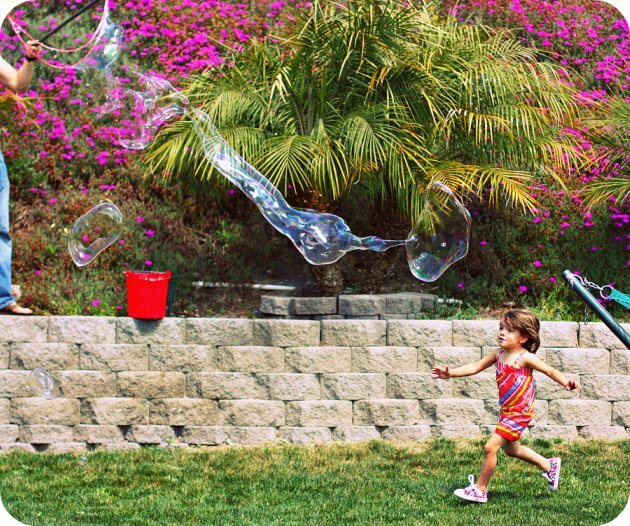 I don’t think our bubbles were as big and perfect as yours, though!